After a sensational night for Daniel Gibson against the Clippers, he is currently leading the league in 3-point shooting percentage at .478 after making 4 of 5 attempts last night. He has 117 attempts. However, he is not expecting an invitation to the All-Star 3-point shootout in his home state in Dallas. ESPN just reported that Channing Frye has been selected. 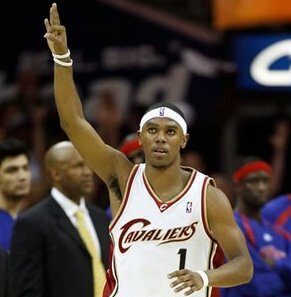 Frye would become the first center to compete in the 3-point contest since Seattle’s Sam Perkins in 1997. The NBA is expected to announce the contestants for the Three-Point Shootout for All-Star Saturday Night in Dallas on Wednesday.